I started this page sometime in the mid 90's, at that point I either hadn't found any scan's of the currently available manuals or they didn't even exist (VT100.net started in 1998). Now there are a good number references available online. The only downside is that they tend to be fairly large *.pdf files containing scans of the original manuals. In the unlikely event you are still using dialup (I did for a long time) some of this information may still be useful in text format so I leave it in place. However I strongly recommend the more detailed graphical references if you can get them. I added a small troubleshooting section in 2008 , but I'm nothing like an expert in this area so take it with a grain of salt. This was one of the most common video terminals used with the PDP-11 series. The VT52 was an earlier model, which had a slightly different set of control codes. The VT100 can emulate a VT52 if desired. The VT2xx and VT3xx models followed the VT100 and typically performed supersets of its command sequence (ie weird color formats!). The VT100 is normally a black and white monitor (although I believe there was at least a black and green CRT) which communicates with a host computer or modem via an RS-232 serial link or optionally a 20 ma current loop. One of the things that makes it interesting is that it was expandable via various option cards. As a point of interest, the original Decmate systems were VT100 terminals with a Harris option card which emulated a PDP8. I strongly recommend vt100.net for more detailed historical information on the VT100 series and the later models. Note the transmit and recieve speeds can be set independantly when in setup B with the '7' and '8' keys, the result is displayed to the right of the option boxes shown above. Most setup B options are toggled with the '6' key. First one places the cursor on the appropriate box above using the left and right arrow keys, the toggle option with '6' key. If you are really lucky there is a big label on the bottom of the keyboard detailing all this, but a lot of people never stuck them on! There are a set of ansi escape sequences that a host computer can send to temporarily modify a terminals characteristics, or ask the terminal its current configuration. One such sequence asks the terminal for an answer back string of up to 20 characters. You can set this string from Setup B by pressing 'Shift' and 'A' at the same time. The terminal responds with "A=" on screen. You type any character which you don't want in your string as a delimiter, then type your string and press the delimiter character again to terminate the string. You can save your current selections by pressing 'SHIFT' and 'S', the terminal responds with "wait" while it stores settings in NVR. If you want to cancel some entries you have made temporarily, press 'SHIFT' and 'R' to recall what was saved last in the NVR. Changes made in Setup or via escape sequences from the host are temporary until a reset or power off/on sequence unless saved per above. The back side of the terminal has the power cord and switch on one side and the i/o ports on the other. The keyboard plugs in with what looks like an old microphone jack. There is at least one male db25 RS-232 connector (some of the other options have more). 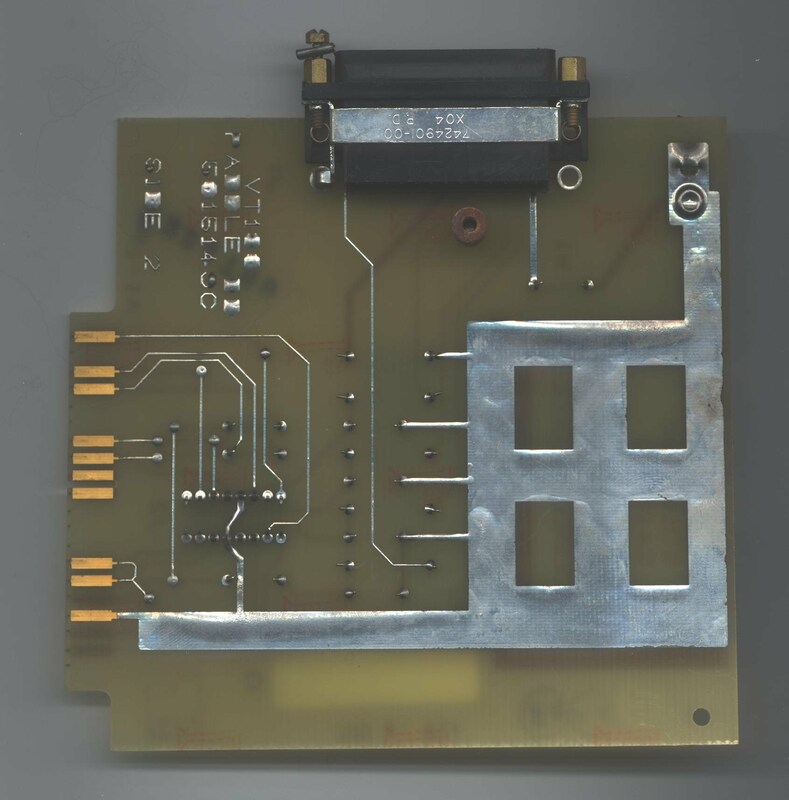 The rectangular piece of the back panel which covers the keyboard and RS-232 connector(s) can be removed with 4 screws. It may contain a current loop option which plugs into the terminal controller module, J5. The terminal controller module is a large (10" x 10") circuit board. In a bare bones VT100 its the only circuit board. 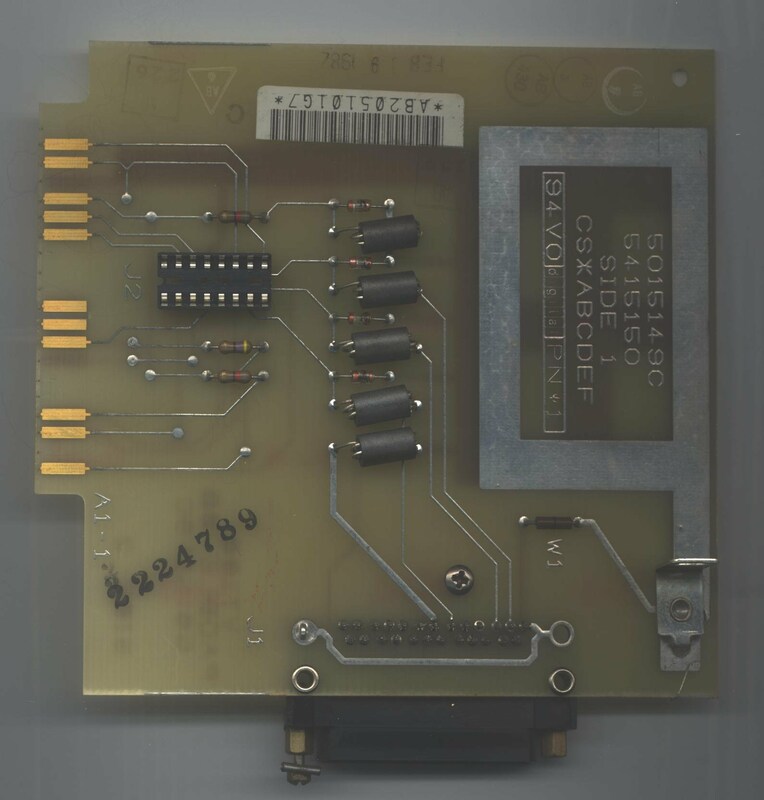 The standard controller board has a edge card connector, J6, on the back which the power supply harness connects to as shown below. The power harness may connect directly to the board, or there may be a small expansion backplane that allows additional boards access to the power supply (as in VT103, VT125, and VT180). [Note 2008 most of the connector numbers below correspond to the Print Sets I've seen, but the print set shows J6 below as the 'Edge Conn']. The video in and out are BNC connectors. J2 is the multi pin (18?) graphics connector used with some options (I've never seen one in use). J5 is the 20ma current loop connector. J3 is the STP connector discussed below. J1 is a row of pins which is always present. If there is an Advanced Video Option (AVO), it piggy backs on the board in the location shown and mates with the J1 connector. The AVO adds some memory which allows a 132 column display in addition to the normal 80 columns. I think it adds some graphics characters also. At power up, a VT100 does a fairly extensive self test. Leds on keyboard should flash and it should beep at you. If all is well the cursor will be displayed. If you get a character and it goes to "offline" mode the self test detected an error. There is a list of about 30 errors, but I'm getting tired and not sure how much it would help you. Lets hope its ok. Many errors aren't fatal, try it on line and see what it does! This has the video capability of a basic VT100 with the addition of the printer port, however lacks an STP slot for option modules. It is not expandable, and I believe was marketed as a less expensive terminal. There was also a VT101 model that was very similar but did not have the printer output port. As a text terminal its very similar to the VT100 but internally its fairly different. These use a different terminal controller module which allows one to setup the printer port characteristics as well as the modem (normal EIA port). The additional printer port is located above the modem port. The modem port is in the same location as it is on a VT100. In setup mode B, one switches between the modem and printer port characteristics by pressing 'Shift' -> and 'Shift' <-. The left and right arrow keys while pressing the Shift key. There is a shorting connector located as shown above on most of the VT100 terminal controller modules. I give it a separate section as the "paddle board" modules that plug into this connector provide the interface to transform the base VT100 into various other systems. When no STP module is installed, the EIA connector (male db25) on the back of the terminal acts as the serial i/o port. When installed, the STP module normally re-routes this i/o port to connectors on the module. Various STP modules I have seen are described in the sections below. If in doubt you can often check out the functionality with an ohm meter given the STP edge card connector layout below. The connector consists of twenty pairs of contacts. The even numbered contacts connect (short to) the odd number in the pair when no module is installed. I don't fully comprehend the table below, but its what the manual says. The even numbered pins are signals from the terminal controller board, odd number pins with an '*' are connected to J4 pins as indicated. On the VT103 and VT180 the paddle board has connectors that send the terminal controller signals to the console port of the extra processor installed in the system and use the J4 port as an extra SLU input for this processor. 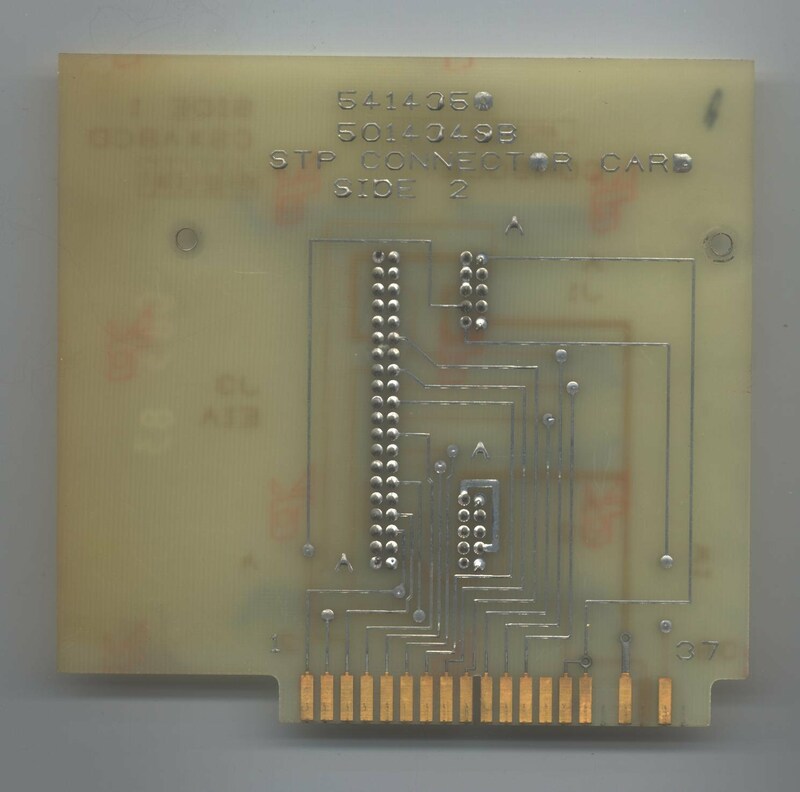 The images below of the VT103 paddle board show that the even number pins, 2-38 are on side 1 of the paddle board and exposed when the board is inserted in the terminal controller STP slot. The odd number pins, 1-37, face the componet side of the terminal controller when the paddle board is inserted in the STP slot. Note the VT103 and VT180 paddle boards are the only ones I've seen, neither uses STP pins 39 or 40. The VT103 is a VT100 case and display with an LSI-11 backplane option. The VT103-BA option included a dual TU58 DECtape II installed in the bottom of the VT100. To support the LSI-11 backplane an H7835 power supply was added (this is an upgrade of standard power supply). Technically the backplane is two H803 (2x4) connector blocks combined to create a 4x4 backplane configuration. It conforms to all backplane configuration rules for 25 cm (10 in) length backplanes per Microcomputer Processors handbook. The is also a fan assembly above the backplane to facilitate cooling. I include scans of both sides of the VT103 paddle board that is in my VT103 system: Side 1 and Side 2.
is labled N/C (not used?). goes to the H7835 power supply. J2 is for 18 pin graphics module. J2 and J3 are for a second serial line unit, SLU. on the connector type of your 2nd SLU. My VT103 had a DEC ribbon cable connection J1 to an M8186 CPU. the bottom of J1 and J2 furthest from the circuit board (see DLV11 pinout). See the DL11 documentation for the M7800, EK-DL11-TM-001, for J3 pinout. closest to the circuit board with AA at the bottom as viewed above. that would join STP:38 and J1:1 if connected with a jumper. This jumper is not installed on my board. the other day with a MXV11 which worked fine in another box. When installed in the VT103, it gave a loud repeating "dash"
allowing the VT103 setup option to control baud rate. to determine what is available for componets. This was my first computer. I'm very fond of it. It is a VT100 with an additional board which contains a Z80 CPU and a floppy disk controller. One can connect four single sided 180 kb floppy disks to this configuration. It has 64 kb of memory and runs a version of CP/M. I was ever so excited when I upgraded from my 300 baud modem to a 1200 baud unit! Its been more than 10 years since I last turned one on, but I still have several in the basement and pat them when I walk by. I also wrote some of my first software for this. A *.asm xmodem program, I forget quite why probably cause my local BBS required it rather than Kermit and I couldn't find an xmodem for the VT180. Later I wrote some routines that would copy the single sided VT180 disks to a PC using the PC's 5.25" drive as I migrated my work to the PC. Doubt anyone needs this, but its available if of any use. The VT180 is not only obsolete, but a pretty rare animal so I won't give a lot of detail although I do have some experience if I can just remember it! Chapters 2, 5 and the Appendice are very similar to other VT1xx setup and installation info, and Chapter 4 on generic CPM operation can be found elsewhere on the web. on the VT18x module and Paddle Board. The system connects the VT18x module to the terminal controller module via the custom paddle board above which is inserted in the STP connector. 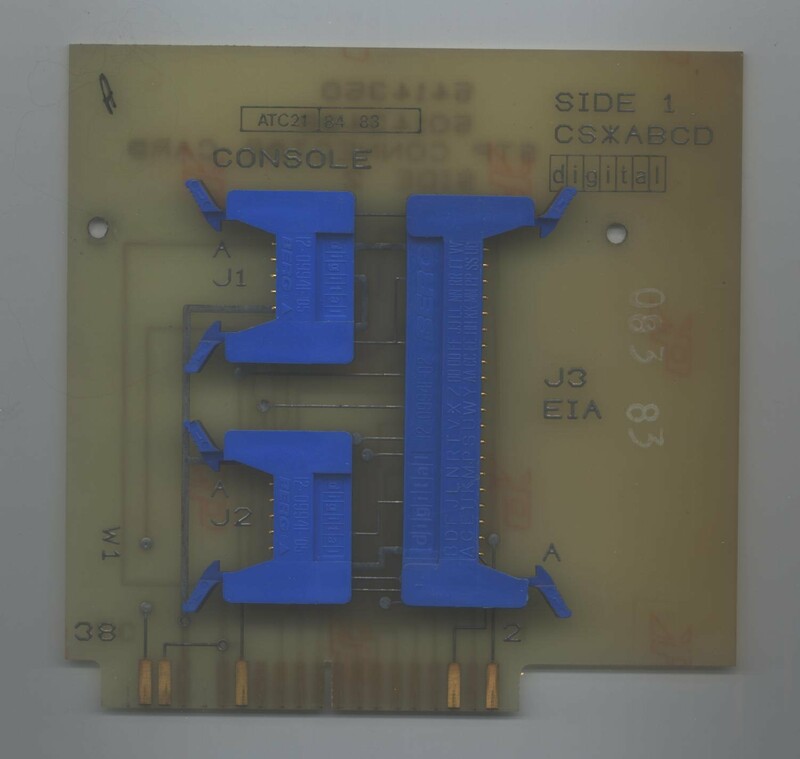 The paddle board has a 16 pin socket,J2, which connects to J3 on the VT18x module via a ribbon cable supplied with the system (red trace at top on both connectors). Table 6-35 pp 6-100 shows the signals carried on this cable and Figure 6-28 pp 6-66 diagrams how the VT-18x control module connects to the terminal controller module through the paddle board. Figure 6-28 maps to my diagram above as follows: PRT => J1 on Paddle board, GP => J4 on terminal controller, COMM => J1 on VT18x module. The STP connector includes the Printer port DB25 connector (PRT above) and converts the standard VT100 EIA (DB25) connector to a general purpose (GP) serial port. Both ports are now controlled by uarts on the VT18x module. The VT18x module also contains the 37 pin disk drive connector port (DISK) and a second serial communications port (COM). All three serial ports are male db25 connectors. When the system boots it does a self test and then you get a menu that prompts for an operating mode. You can boot off floppy disks A-D (it always offers this even if they aren't installed), run the self test, or run in terminal mode. In terminal mode the COM port passes RS-232 data directly to the terminal controller module as if it were a VT100 (note COM is not the normal i/o port for a VT100). The COM port parameters are derived from the SETUP B terminal controller module settings. The PRT and GP ports are controlled via CP/M. The table above works for the Shugart Model 400L, but the Teac drives only had 6 dip switches, and switch # 5 was always on as well as the ones shown above. As shipped the system only wrote single sided disks, but the controller has the capability to talk to double sided drives. Fifteen years ago when this was a hot topic on Compuserve, there was information on how to make the disk controller work with other disks, including 700kb 3.5" disks. I have some of this information, but never tried it, seemed like it was easier to get a newer computer that already knew what a 3.5" disk really was! Besides, I seem to remember you had to soil your hands with a soldering iron and make patches in the CPM bios. I was contacted in 2006 by Dave who had obtained a VT18x module and disk drive, but no paddle board, disk drive cable, nor terminating resistor. His questions goaded me into scanning the technical manual, but we found there still appeared to be some unanswered questions. I spent a couple days measuring resistances and looking at the paddle board on my system to see if I could figure out how to generate the missing componets or at least generate a work around solution. For the historical record I include scans of both sides of the VT180 paddle board: side 1 and side 2. Take the following observations with a grain of salt, but its the best I can come up with and my paddle board does appear to match the technical manual description! As previously mention, Figure 6-28 pp 6-66 of the Technical manual includes a skematic of the paddle board. To the best of my knowledge the pinouts for the IC sockets, J2 and J3, for the ribbon cable between the VT18x and paddle board shown above matches this skematic although I see no mention of the pinout in the manual. Matching the socket locations for the J1:# printer port pins confirms this numbering as does the fact that J2 locations 5 and 13 are clearly tied to ground, and location 8 connects to nothing. The technical manual does mention that the paddle board contains filtering elements for the printer port, J1. These are partially indicated by the inductances L1 - L5 shown in figure 6-28, and seen as five black cylinders in the center of side 1 of the paddle board scan. I'm told these have a ferrite core to limit propagation of high frequency noise on long serial lines. Although not shown in figure 6-28 there is what I'm told is probably a 100 pico farad capacitor connecting the side of the inductor furthest from J1 to ground for J1 pins 2,3,6, and 20. You can just see these next to the inductors in the scan of side 1. There are also a couple resistors as shown in figure 6-28 which are tied to the +12v supply from the terminal controller to provide control signals for the printer and general purpose ports. Table 6-12 pp 6-67 lists the signals carried by the disk drive cable. I examined one terminating resistor pack on my A-B drive pair. It appears to have two part numbers on it: CTS7420 and 60-3-R150. Note the R150 is followed by an ohms sign which I can't reproduce. The pack is an IC with two rows of 8 pins each. One measures a resistance of 150 ohms between opposite pins, ie if pin 1 is the upper left and pin 16 is the lower right I measure 150 ohms between each odd numbered pin and the next higher even number such as 1 to 2 and 15 to 16. In most cases you can find the large PDF documents at both bitsavers.org and VT100.net. The last time I looked in 2008 Bitsavers requested people to use one of the active mirror sites which I have attempted to do below. However its worth looking around, new things turn up, and I rarely update these pages. Unless you've got a good connection I recommend verifing the file size before downloading, several are more than 20Mb as indicated below. Note that *-TM => Technical Reference Manual, *-UG => User Guide, and the Print Sets include schematics and componet locations. There is a modest amount of duplication between the VT100 and VT103 Print Sets.